It’s not the weekend quite yet, but I was inspired to take my mind off some very sad news about my grandfather (vovô in Portuguese). If you’ve seen my Facebook updates, you know he had a stroke recently and lost 2/3 of his brain and was paralyzed on the right side, and since then, it has been touch and go. Unfortunately, there’s not enough the doctors can do, and it is just a matter of time before he passes. So, I took out my copy of SOS! The Six O’clock Scramble to the Rescue by Aviva Goldfarb to find something to make for dinner that was easy and mindless. Typical me, I had to spruce it up and change it around. I didn’t have any shredded cheddar, but I had some sliced cheddar, I didn’t have any mustard powder, and I didn’t want sausage. 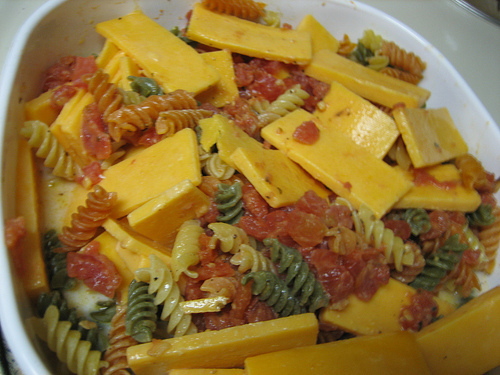 Instead, I used pepper and some diced canned tomatoes, along with the salt, nutmeg, sliced cheddar. 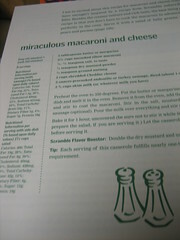 First, you melt margarine in the casserole dish before adding the macaroni and ensuring it is covered with the butter. Once that’s done you add the other ingredients, plus milk and bake at 350 for an hour. 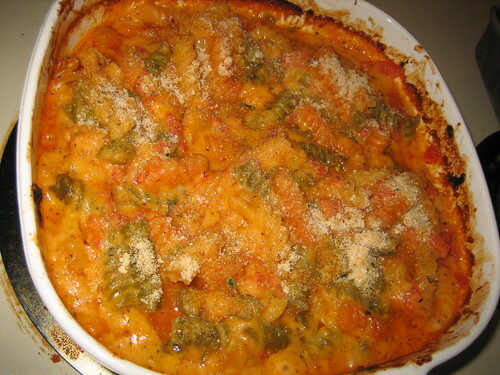 Again, I put my own twist on it by adding about a teaspoon of flour to thicken the sauce and reduced the amount of milk since I also had the juice from the tomatoes. You bake it in the oven without a cover. 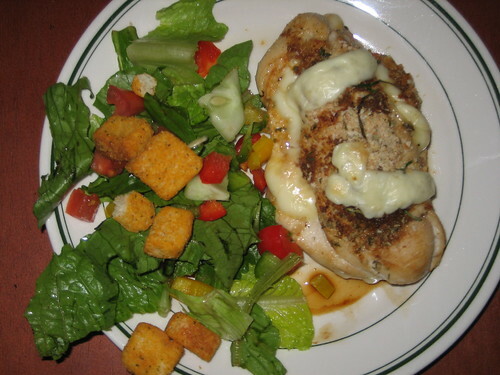 This is the finished product with some browned bread crumbs on top. Thanks for stopping by and when I feel like reading again, I will have some reviews for you. Please bear with me. If you missed my earlier review of this cookbook or my interview with Aviva Goldfarb, please check them out. Since writing this my grandfather has passed away. I’ll probably be offline for a while. If I miss anything important, please email me. Thanks to everyone for their support, prayers, and condolences. I was hopping through Google Reader when I came across a post about recipes and Katie Brown Celebrates over on B&B ex libris. Anyway, she got me thinking about my various creations, and here’s one that I posted on an older blog that I really loved making and eating. Check it out, try it. Tell me what you think. It is not often that I cook meals at home because frankly, I’m not that great a cook. However, on a rare occasion that I do cook, I mostly make up a recipe on my own. 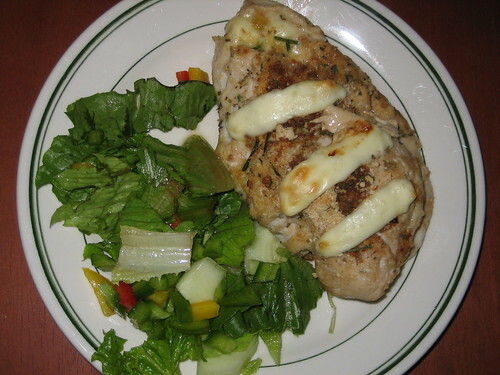 I was extremely excited about how the Chicken Mozzarella turned out last night, that I figured I would blog about it and share the recipe. 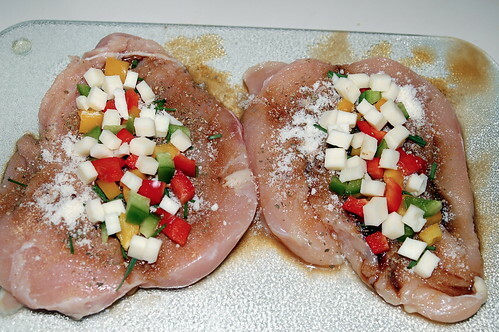 I started with two breasts of chicken and I split them horizontally so I could stuff them with yummy cheese and peppers. 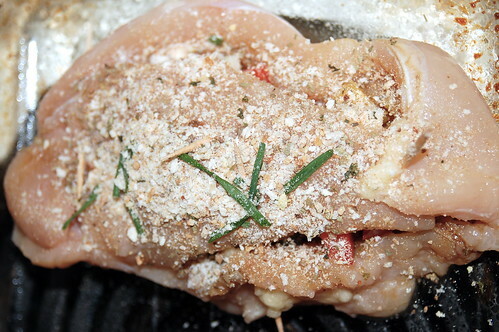 Once the breasts were split, I seasoned the insides of the chicken with garlic, oregano, pepper, onion, Parmesan cheese, and Worcestershire sauce. I diced up the red, green, and yellow peppers as well as the mozzarella cheese and chives. See Below. 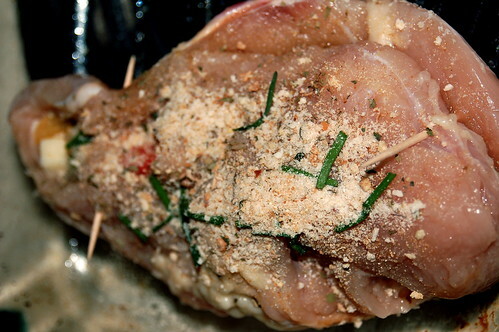 Once the inside was stuffed to the brim, I closed the chicken breasts with toothpicks. 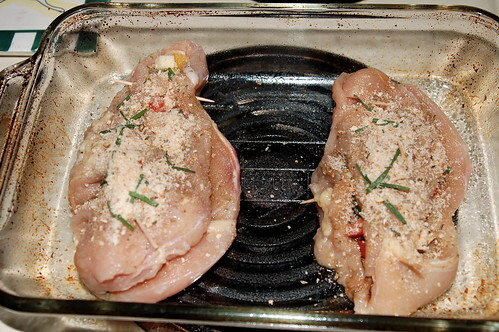 Topped the breasts with Italian seasoned bread crumbs and chives, and set them in a lightly sprayed glass baking dish. Check these images out. Mind you, I am not a culinary genius. I baked the chicken breasts in the oven at 375 degrees for about 25 minutes or so (yes, I often fail to use a timer and do things sort of by hunches). When the chickens were nearly cooked, I placed slivers of mozzarella on the top to add more cheese, because I just love cheese. I placed the breasts back in the oven for a bit longer, maybe about 10 more minutes until the cheese melted and the breasts were fully cooked. And here is the result. I bet you are all salivating now. Enjoy!